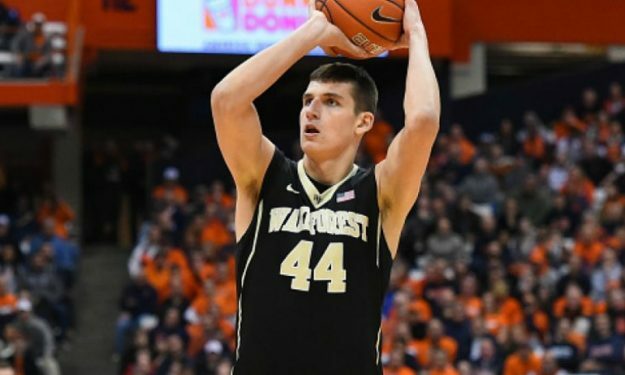 Despite the fact that recently Dinos Mitoglou said that he would prefer to return to Wake Forest for his last year in college, things have changed. Mitoglou himself stated that he was near the decision to return to the States, but a proposed four year deal with Panathinaikos made all the difference. The Greek power forward who is currently training with the Greek national team has the chance to become professional. The offer made by the Greek champions is lucrative and the only things left in order for the deal to happen is a buyout to his former club, Aris BC, which has the rights to the player in Greece. According to sources close to the situation, the discussions between Aris and Panathinaikos are the only piece missing in the puzzle in order for the transfer to be completed. UPDATE: As it turns out according to the contract that was signed only by Aris BC when the player turned 18 years old, the rights of the club for Mitoglou expired on the 30th of June. No buyout is required and it’s just a matter of time before the deal with Panathinaikos is announced.